This grain-free apple crisp has a lot going for it. Think warm, tender, cinnamon-spiced apples in caramel-like sauce under perfectly crisp nut topping. I can barely describe how delicious it is! People often ask me what my favorite dessert is. The answer? Anything baked with apples. When I was growing up, my mom never asked me what I wanted her to make for a dessert. It always was (and still is!) the same: apple strudel, apple pie, or apple crisp. I don’t even think this is a hot take. I love brownies, and ice cream, too, and acknowledge that cake is pretty good most of the time and that cookies are fine if there’s nothing else around to eat. But warm apple desserts with a flaky crust or a crumbly topping are simply the best! I mean, can it get even more classic than that? Out of all the apple desserts, apple crisp is a winner in my books. It takes a fraction of the time it takes to make a pie or a strudel, with an even smaller fraction of the work. It wouldn’t be an apple crisp without apples. For the best flavor, use a combination of sweet and tart apples. If you really want to use just one variety, I would recommend Golden Delicious. Firm-tart apples: Granny Smith, Esopus Spitzenburg, Northern Spy, Idared, Pink Pearl. Firm-sweet apples: Ginger Gold, Golden Delicious, Jazz, Jonagold, Pink Lady. The diversity adds a depth of flavor, while the firmness of each type helps the apples hold their shape through the cooking process. If you’re wondering about McIntosh or Cortland apples, you can, of course, use them. My grandma makes her apple pie exclusively with McIntosh apples. My problem with McIntosh apples is that they don’t hold their shape well, cooking down into a sauce rather quickly. So, how do you thicken the juices that the apples release? I use kuzu root (also known as kudzu). Never heard of it? Kuzu root is a starch that acts just like any other starch. The difference is that kuzu is considered a superfood. In traditional Chinese medicine kuzu root is considered to be one of the 50 fundamental medicinal herbs, and has been praised for its medicinal properties in China and Japan for thousands of years. It is widely regarded as the healthiest cooking starch, or jelling agent, in the culinary and confectionery world, as well as the medicinal world. In the complex world of fruit dessert taxonomy, crisp is a distinct entity from cobblers, crunches, and crumbles. Cobblers rely on some kind of dough. Crumbles call specifically for oats. Crunch prefers bread crumbs. But crisp—crisp can use nuts, and that’s where things get interesting. Because, well, nothing complements fruit like nuts. However, if you have a nut allergy, you can easily substitute oats. 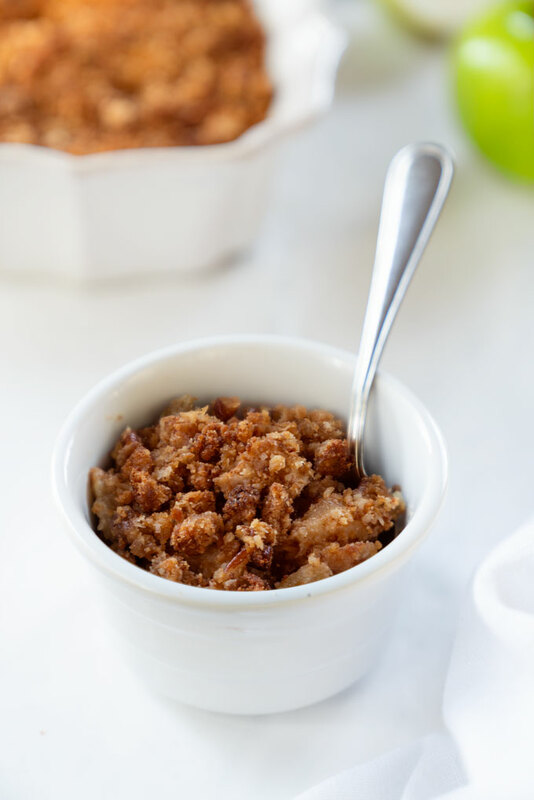 This apple crisp is a mixture of almond flour, shredded coconut, and chopped pecans. I also used a combination of coconut sugar and maple syrup to sweeten things up, but you can use any sweetener you like. Once you’ve figured out your apple crisp components, putting it together is a snap. The only question you might now have is: to peel or not to peel the apples? You can do either. If I’m making this for Tanner (who finds the peel too hard to eat), I peel the apples. If I’m making this for myself, I leave the peel on. I usually start with the topping, using a bowl and a wooden spoon to mix all the ingredients together. If you use a food processor, be careful not to over-process the topping. Ideally, your crisp would have an integrated flavor, but plenty of textural contrast. You don’t want to end up with a sticky dough that will be too smooth to crackle in the oven. For a light, crackly texture in your topping, don’t press it deep into the fruit. Just spoon it out, and spread it to the edges of the baking dish in a roughly even layer. Some imperfections are just fine. 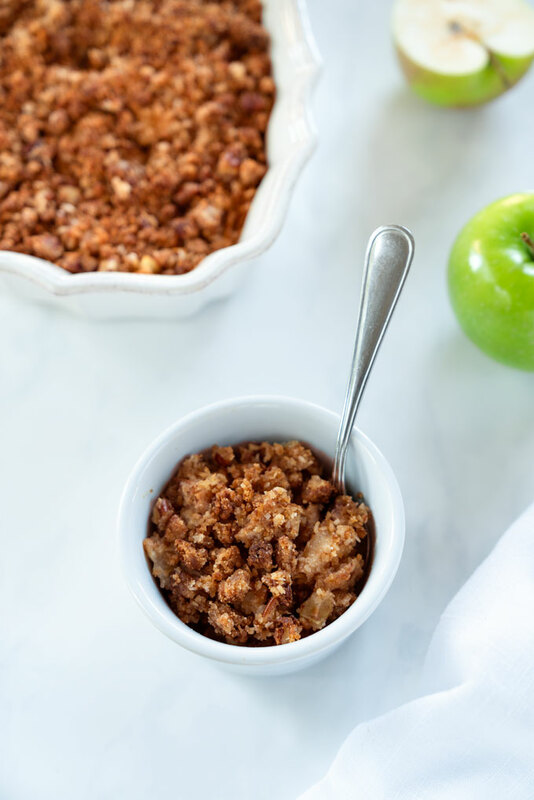 This grain-free apple crisp has a lot going for it. Think warm, tender, cinnamon-spiced apples in caramel-like sauce under perfectly crisp nut topping. Peel the apples and remove the cored. Thinly slice the apples lengthwise and add them into a 9"x 13" (22.5 cm x 33 cm) baking dish. Mix the kuzu root with water until completely dissolved. Add all the remaining filling ingredients to the apples. Toss to combine. 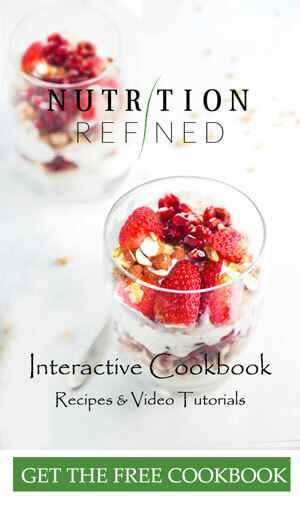 Add the almond flour, chopped pecans, coconut, coconut sugar, and salt into a large mixing bowl. Stir to combine. Then add the coconut oil and maple syrup, and mix again (with a spoon or your hands) until evenly distributed. Spread the crisp topping evenly over the apples. Bake the apple crisp uncovered on the center oven rack at 350°F (175°C) for 50-60 minutes or until the filling is bubbly and the top is golden brown. Store leftover apple crisp covered in the refrigerator for up to 3 days. For longer term storage, cool the crisp completely and freeze in an airtight container for up to 3 months. 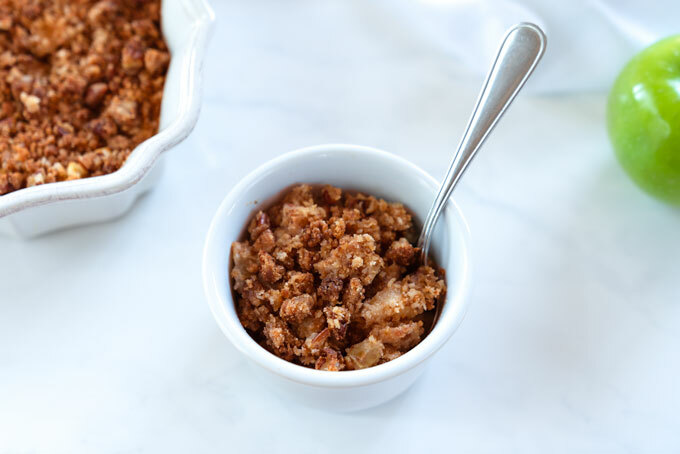 The best way to reheat the apple crisp is to let it thaw overnight in the refrigerator, then warm in a 350°F (175°C) oven for 20-25 minutes or until heated through. *Use a combination of firm-tart and firm-sweet apples. I used 4 Granny Smith apples (tart) and 4 Golden Delicious (sweet) apples. I made this for Thanksgiving, and more of it disappeared than the bakery apple pie next to it! The flavor and texture were wonderful! Because I had walnuts on hand, I slightly maple glazed and toasted them to try to get a similar effect to the pecans called for. I also used a stevia based sweetener instead of the coconut sugar. Yet, even with what I would consider inferior ingredients, the crisp was great! For reference, I used Granny Smith and North Carolina Gold apples. I made it yesterday and my home smells of apple and cinnamon soooo wonderful! Simple, fast, healthy idea for apple crips-pie! I added a little bit of granulated stevia instead of coconut sugar. The result is great!! I love baked apples and there are very good for our digestion! Thank you, Petra, for this amazing, warm recipe with apples! I made it today and my family of four devoured the whole thing! It was soooo delicious.